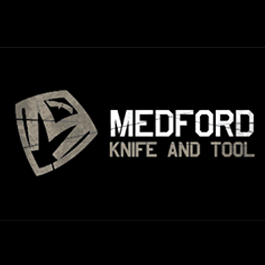 Greg Medford and his team at Medford Knife & Tool are dedicated to creating personalized custom knives. Greg is an innovative designer who draws inspiration from his hardworking parents and the hardships they were presented with. His designs bring marry form and function in order to produce the most practical yet attractive premium-quality custom knives on the market. Greg is no newcomer to the design and use of knives – he has been restoring period Japanese swords since the mid-1980s and is also a professional Martial Artist and hand-to-hand instructor. We have done our homework. We have set our egos and market mythology to the side in choosing our knife materials. Don’t be duped by ads, stories and forums. We believe that modern D2 is the best bang for the buck in high-end knives. It can do almost everything as well as almost everyone needs. For mandatory true stainless specs we use S35VN, as it is outstanding at everything knives must do. For any given tool a variety of steels will often suffice. Many steel choices can be adequate and a very few are ideal. Interestingly, “ideal” is often nuanced and as much opinion as fact. Knives need the proper blend of hardness, toughness, and abrasion resistance. These three traits are like a 3 position teeter totter. Greatly increase any and the others pay the price.